The end of WW1 remembered and celebrated. 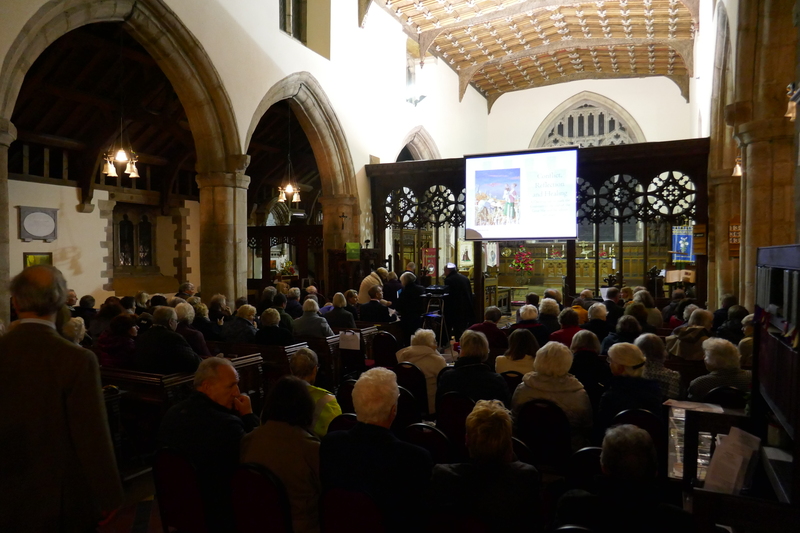 Titled ‘Conflict, Reflection and Healing’, we held a special evening programme devised and presented by members and friends of Guilsfield Parish Church that consisted of sacred and light music as well as dramatic readings of letters and poems, written during the Great War. These were illustrated by poignant and dramatic Images and Artwork, created during the conflict. Those whose names are on the village War Memorial, young men from the community, who were killed in action during the Great Conflict, were remembered. 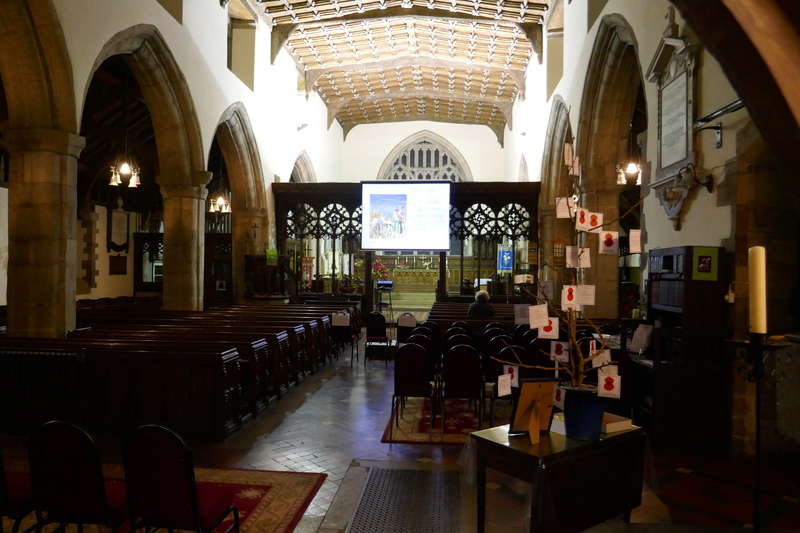 Guilsfield Church’s marking the Centenary of the end of WW1, began at 7.00pm on Friday, 9th November, when the bells were rung half muffled from the church tower to invite people to a special Centenary presentation held in the church. 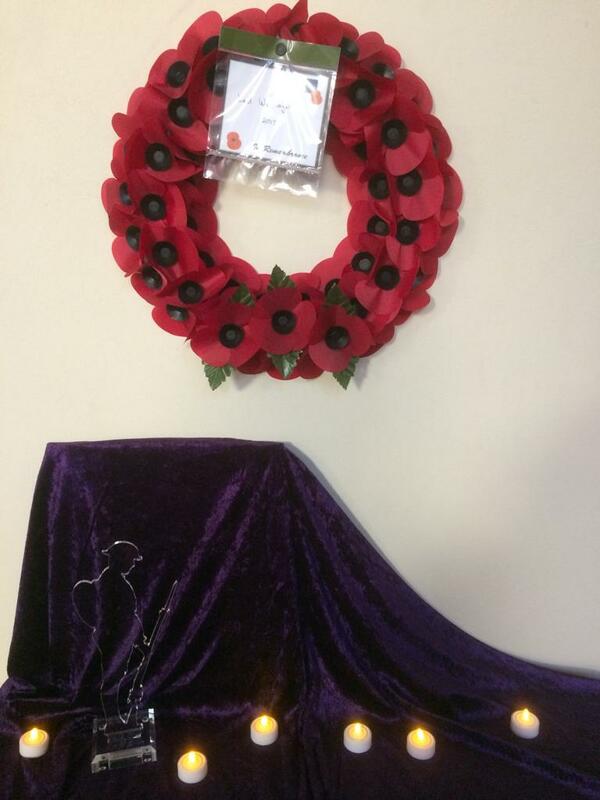 Inside the church, a display of sewn and crocheted poppies created especially by members of the WI were on display, as well as a ‘Tree of Life and Prayers’ festooned with pendant cards inscribed with the name of each serviceman who died. 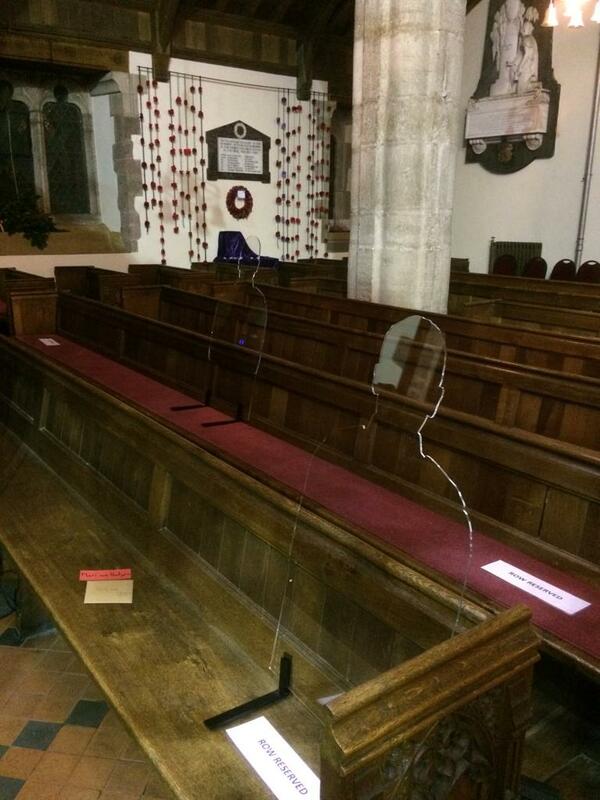 ‘Seated’ in pews within the church were ephemeral silhouettes of soldiers; these are part of the National Remembrance Symbol created for this Centenary, and are entitled, ‘There, but not there’. At 7.30 the programme of music, sung and recorded, poetry, hymns, prayers and striking artwork from the WW1 began. Taking part were: Guilsfield Church Choir, augmented by members of Guilsfield Singers and members of local church congregations. Rev Philip Harratt accompanied the music items. Sarah Garratt was the soprano soloist and Mari von Hulsen the flute soloist. Poems and letters written during the war were read by Members of Guilsfield ADS – Paul Preece, John Kneale, Peter Fantham, Gareth Davies, Liz Mattheson, Sylvia Bestwick and Susan Jones. Dr Ian Russell read out the Roll of Honour. Musical items included an illustrated setting of ‘For the Fallen’ by Lawrence Binyon set to music by M Blatchley; ‘Go Silent Friend’, words by John Bell, ‘Prayer for peace’ and ‘The Blessing of Aaron’ sung by the choir; and solos of ‘Till We Meet Again’ and ‘When I Am Laid to Earth’ sung by Sarah Garratt. Poems included ‘The Soldier’ by Rupert Brooke and ‘To His Love’ by Ivor Gurney. Sue Jones read a short reflection on the painting ‘Through’ by Sergeant Francis Martin of the Signal Service, which we were given kind permission to use by the Royal Corps of Signals. It was lovely to see the church so full for this event, despite the inclement weather and a retiring collection was taken in aid of the Earl Haig Fund, which supports veterans from all conflicts and other military actions involving the British Armed Forces.